(Turkish ‘Rüstempaşa Camii’) is located in Hasırcılar Çarşısı (Strawmat Weavers Market) in Fatih. It was designed by Ottoman imperial architect Mimar Sinan for Grand Vizier Damat Rüstem Pasha. Rüstem Pasha died in July 1561 and the mosque was built after his death from around 1561 until 1563, on a high terrace over a complex of vaulted shops, the rents of which were intended to financially support the mosque. The mosque complex now hosts a Koran school. 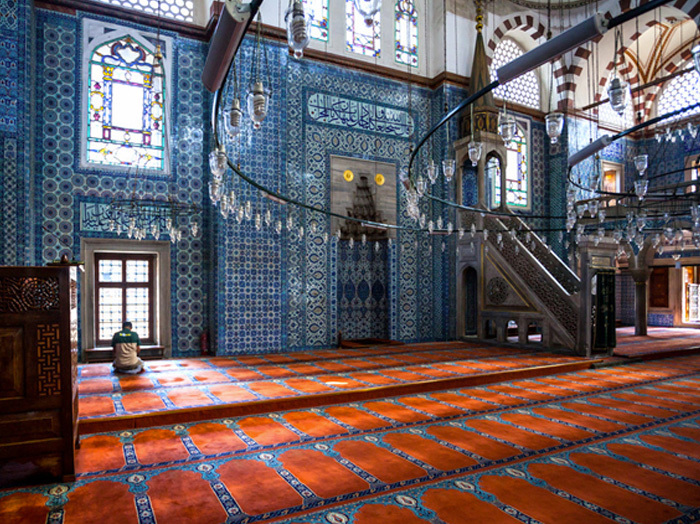 Rüstem Pasha Mosque is famous for its large quantities of exquisite Iznik tiles, set in a very wide variety of beautiful floral and geometric designs, which cover not only the façade of the porch but also the mihrab, minbar, walls, columns and on the façade of the porch outside. These tiles exhibit the early use of the tomato-red color that would become a characteristic of Iznik pottery. Some of the tiles, particularly those in a large panel under the portico to the left main entrance, are decorated with sage green and dark manganese purple that are characteristic of the earlier ‘Damascus ware’ coloring scheme. No other mosque in Istanbul makes such a lavish use of these tiles.